Only one candidate seemed to have an especially active subreddit dedicated to their campaign during the three months studied: Vermont Sen. Bernie Sanders. As discussed below, the /r/SandersForPresident subreddit attracted tens of thousands of comments and prominently offered users the chance to engage with the campaign. Of all other subreddits dedicated to individual candidates, only those focused on Sen. Rand Paul (R-Ky.) attracted any significant number of comments, and even then the number of comments naming a candidate in /r/RandPaul only amounted to about 2% of those in /r/SandersForPresident. Some candidates even attracted subreddits dedicated entirely to making fun of the candidate, and two subreddits dedicated to Donald Trump, /r/The_Donald and /r/donaldtrump, have argued over which is the real Trump 2016 subreddit, with one accusing the other of being run by Sanders supporters. The discussions around the three candidates that received by far the most comments – Sen. Bernie Sanders, former Secretary of State Hillary Clinton and business mogul Donald Trump – offer a window into the kinds of conversation patterns that can take place on Reddit. Though Sanders was less well known by the public than Clinton and Trump during the time period studied, he was mentioned in about 165,000 comments – more than Clinton (about 85,000) and Trump (about 73,000) combined. The number of comments naming Sanders rose over time, doubling between June (about 38,000) and September (about 85,000). One event that may have helped fuel the conversation around Sanders was an “Ask Me Anything” (AMA) session held by the candidate in May 2015 that attracted nearly 13,000 separate comments, far more than the average of 60 comments for AMAs that month. That was clearly not the only driver of comments, as the high level of interest in Sanders continued in June and roughly doubled by September, even without the AMA as a focus of attention. One of the most popular subreddits for Sanders was one dedicated to his presidential candidacy: /r/SandersForPresident. While at least five of the candidates in the study have name-specific subreddits devoted to them, Sanders’ stands out. The candidate’s subreddit received more than 200,000 comments overall in the three months studied, with more than 59,000 that mention any candidate by name. In addition to discussion, the channel also serves as a place for grassroots organizing, as the banner across the top includes links for users to volunteer for Sanders, to attend Sanders events and to watch Sanders on television. 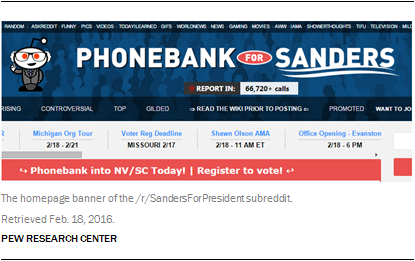 The information available does not indicate whether the subreddit was originally created by or as a part of his campaign, but it clearly serves as a pro-Sanders hub. Only 4% of comments in /r/SandersForPresident were “downvoted,” less than half the rate we saw among comments from all subreddits (for more on downvoting, read here). Not all of the subreddits devoted to Sanders are supportive; at least one criticizes the Reddit community’s focus on Sanders. Comments in this type of forum accounted for less than 1% of all comments about Sanders over the three months studied. There is also evidence of a highly engaged base of commenters discussing Sanders. Almost one-in-four users (24%) who named Sanders in a comment posted three or more comments naming him. This is a higher proportion of users leaving three or more comments than for any other candidate studied. The Sanders phenomenon on Reddit echoes former lesser-known candidates who garnered attention or support in digital platforms despite the fact that they did not have as high a profile in traditional media. In 2011, Texas Rep. Ron Paul, though behind other Republican candidates in the polls and in mainstream media coverage, enjoyed somewhat more activity on Twitter – with more than 1.1 million tweets referencing his campaign, which ranked him fifth among eight Republican candidates and gave him a more favorable tone in the Twitter conversation than any of the other candidates. And back in the 2003-04 primary season, before social media era became a major force in politics, Vermont Gov. Howard Dean attracted a digital-savvy activist base that marshalled web-based tools such as meetup.com to organize and discuss their candidate. 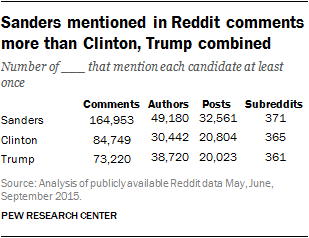 Hillary Clinton, the second-most discussed candidate on Reddit during the three months studied, was mentioned in about 85,000 comments. As with others, that number rose over time: In September, Clinton was named in 43,000 comments – about twice as many as May or June. Unlike Sanders, whose campaign-specific subreddit attracted a great deal of discussion about the candidate, Clinton’s campaign and supporters do not appear to use a dedicated subreddit in the way that Sanders does. 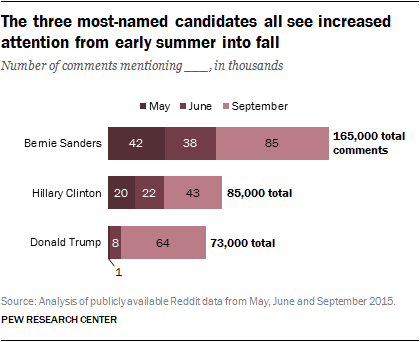 Of all the 350,000 comments that mentioned a candidate during the three months studied, just 61 appeared in a candidate-specific subreddit devoted to Clinton. Nonetheless, users who mentioned Clinton seemed to be relatively active participants: 21% left three or more comments naming her within the three months, second only to 24% of comments mentioning Sanders. Donald Trump was named in about 73,000 comments on Reddit during the three months studied, making him the third-most mentioned candidate. The Reddit discussion about Donald Trump stands out for its rapid growth over time, jumping from just 8,000 in June – the month Trump announced his candidacy – to nearly 64,000 in September. This eightfold increase outpaces the overall rise in the number of comments studied, which rose about 150% from June to September. Not only was there more discussion about Trump as the campaign progressed – the scope of where he was being discussed broadened as well. Generally, comments about the Democratic candidates ranged across most subreddits, as both Clinton and Sanders were discussed each month in at least 300 of the 373 subreddits where candidates were mentioned most often. Comments naming Trump, however, rose from 146 in May to 268 in June and 355 in September. Comments mentioning Trump also stand out for being more likely to occur in general information exchange subreddits such as /r/AskReddit or the “Ask Me Anything” forum. About one-in-five of these comments (19%) appeared in these subreddits, 8 percentage points higher than comments connected to any other candidate.